Oh, the side panels do actually line up perfectly. The slight gaps you can see in the photos are all to do with my imprecision with magnets rather than the size or shape of the panels. Here's a couple of shots of the Russ I'm adding the new Secret Weapon armor kit to. The parts went on really easily and look great. The turret armor needed to be set back a little on the demolisher turret as the wider moving front would get blocked by the armor if it was slid all the way forward. The side armor has a decent amount of give as to where exactly it sits so you need to make sure both sides line up. I've magnetized everything on this tank. On the turret you can change out the main gun and the ammo box on the back. On the sides the sponsons can be removed and replaced by the sidings that come with the kit. And of course, all the rest of the guns will be swapable. Here's the first few shots. I'll post more as it progresses. A Reaper mini rather than a GW, but seems perfect for joining my command squad as an officer of the fleet to annoy the folks with troops in reserves. I still need to base him properly, but he's finished for the most part. I picked up a manticore that is now assembled. I pinned the stormeagles so they are removable. Also added a bit of 'realistic blood effect' when I cut myself on one of the staples I was using for pins. My IG army is now near "completion". A couple of chimeras and another vet squad (plasma vets this time) and it'll be ready to do or die on the battlefield. I've been really enjoying building and painting it, but its definitely time to put it to the test a bit more. Of and the second new toy isn't really a toy as it will make me money. Canon 300 f/4 L IS. And people say GW stuff is expensive. I used it for the manticore photo. Not bad for handheld in regular lighting. Can't wait to take it out to put it through its paces. Things have been progressing OK on the painting front. The backlog has been building though, and as I'm working on learning new techniques and trying new things I've been slowing down. The Chaos Daemon is 'finished'. I'm OK with it, the style I was going for only half worked. I finished another Russ too. Went simple on this one and actually prefer it to some of the stuff I did on the Chimeras. I magnetized all the weapons too, although the turret can only swap between battle cannon and vanquisher cannon. The demolisher turret was so much easier to magnetize. Lastly, the 3 reaper minis I picked up. I've been working on doing my skin tones better, so added some darker colors. Repeated attempts to get things looking OK so its on a bit thick. The guy (officer of the fleet for my IG) is coming along OK, the other two though, not sure about. I'm far from happy with them yet. 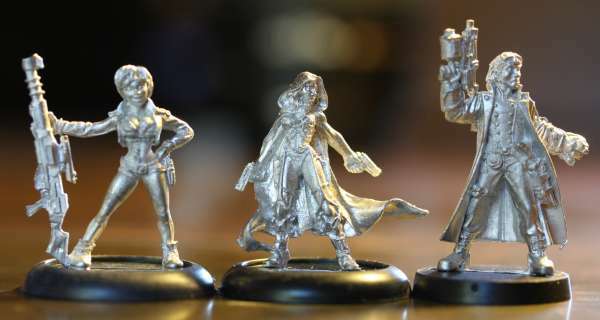 I picked up a few Reaper Chronoscope minis as I'd been checking out their line for a while. I'd never bought any because, hey, GAMES WORKSHOP FOREVAR. Seeing them though, makes me think GW has a lot in common with Apple. Their product is no better than anyone elses, frequently limited, and often has weaknesses you can avoid elsewhere. They just rely on marketing and customer herd mentality to ignore that. So I look at these guys. They need next to no clean up, I've only seen some really minor flash. The mold lines are next to non-existent. The have just as much character as the GW minis and more than some. And, they were $3. The absolute cheapest you can get a metal GW mini for is $5 and that is in a set of nearly identical figures. Most of the individual minis are $10.75 and up to $17 for the slightly larger ones. Compared to a better cast $3 mini? Damn. The woman on the left is going to be added to my IG snipers, the woman in the middle is going on a cool looking display base, and the guy on the right is going to be an officer (possibly a commissar) in my IG army. Yeah yeah, I know you can't use non GW stuff in a tournament. Thing is while I like the games I'm more in it for the modeling side. I have more fun there making them than playing with them. Oh and these came from Miniature Market who'd I'd definitely recommend and will use again. Good prices, quick shipping, very well packed.